Recently I started working on a new project with an industrial edge to it. It is a change from what my clients normally ask for and has been a ton of fun to work on so far. Today I decided to take it a step further and mix an industrial edge into my usual Mid-Century Modern style. I chose pieces from some of my favorite retailers to complete the look. This look can be done by hunting for the perfect vintage finds, which is a love of my husbands and mine as we curate our own collection for our house. 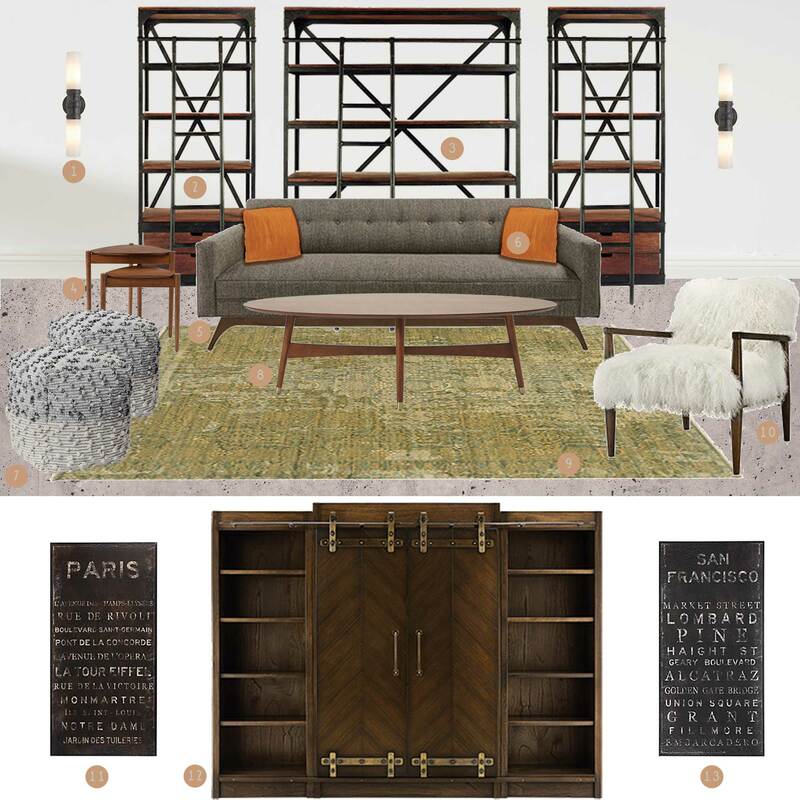 However, those are usually one of a kind finds and I wanted to make sure the selections on this mood board are accessible to anyone who wants to create this look in their own home. Graydon Double Wall Sconce (Rejuvenation) – I chose this for the dark bronze accent that ties in with the other metal accents in the room. The tall sconce adds height to the wall and looks nice flanking the shelving units. Colton 34″ Library (Arhaus) – This piece was chosen for the great mix of materials. The mix of wood and iron adds that industrial edge to the space. This also adds a great way to accessorize the room. I would fill the shelves with a mix of books and items collected from our travels. Colton 63″ Library (Arhaus) – Center this behind the sofa with the smaller units on each side. It covers a large area making an impact and anchoring the room behind the sofa. Retro Tripod Nesting Tables (West Elm) – I am in love with the triangular shape of these tables and the fact that there are two. This is great when needing a table in another spot in the room. It is easy to move, but will still sit nicely in place when not needed. Great for when company is over. Brekan 90″ Upholstered Sofa in Tribeca Pewter (Arhaus) – I can never resist a sofa that has a mid-century vibe to it, which is why I fell in love with this. The clean lines of the upholstery look great with the slight curve in the base/legs. The single row of tufting on the back cushion adds just enough detail without taking away from the clean look of the sofa. Pleated Silk Pillow Cover – Copper (West Elm) – I love mixing a bit of orange into my mid-century rooms. It is a great color for the era and can also lend a bit of a 70’s vibe to a space if you want to go that route with it. The pleating of the silk adds texture to the sofa, which adds more interest and layers to the space. Tidal Weave Pouf (West Elm) – I love a good pouf, especially when it adds a bit of texture to the space and this pouf does just that. Get two of them to sit opposite the side chair. These are great for added seating or add a tray on top to display accessories. Another great element to have when entertaining. Reeve Mid-Century Oval Coffee Table -Pecan (West Elm) – Another classic look for the mid-century space. Not quite the shape of a vintage surf board style coffee table, but it gives the feel of that look. Although the woods in the space don’t all match exactly the warm walnut like tones of them all tie everything together. I love to mix and match wood finishes in a space. When mixed correctly it creates a warm and inviting feel. Amrita Hand Knotted Medallion Rug in Olive (Arhaus) – Always use a rug to anchor a seating area. It helps to define the space and is a great way to add color and pattern to the neutral tones of the furniture. Tansy 28″ Upholstered Chair in Tibetan Ivory Sheepskin (Arhaus) – I am a sucker for anything that is obscenely fluffy and this chair is just that. I usually fall for pillows like this, but when I found this chair I knew it had to be part of the room. The wood tone mixes wonderfully with the other woods in the space. The lines of the chair echo the mid-century vibe I am going for and the upholstery adds a bit of texture to the space. Who could resist sitting in this. I am not sure if I would rather be in it or across the room on the sofa where I have a great view of it. Paris (Z Gallerie) – Art is something I like to personalize to my clients. I chose this because Paris is a special place to me and I like to decorate with items from our travels, art, accessories and my own photography from my travels. This piece is a great accent to that as it has meaning and memories associated with the sites listed. It has a vintage/industrial vibe to it as well. Lawrence Media Cabinet in Midnight Java (Arhaus) – This is a large piece for the space that would sit opposite the sofa. It adds another warm wood finish to the space, but it is dark enough that it mixes nicely with the others. It adds more space to accessorize the room. It also has the task of housing the necessary living room items, the TV, cable box, Blu-Ray player and game systems. All this can be hidden on inside on shelves and in drawers. The middle doors slide open to reveal everything when you want to watch TV and slide closed to hide it all out of site when not in use. The brass hardware adds a bit of sophistication to the piece all while keeping the industrial vibe. San Francisco (Z Gallerie) – Another art piece to tie in with the travel theme and flank the other side of the media cabinet with the Paris art. Many of the main pieces used to anchor this room and tie everything on the mood board together are from Arhaus. Be sure to head over to their living room page to get even more inspiration for your space. Who knows, you may be inspired to create a mood board of your own, or maybe even remodel your entire space!